Your target audience is at SLEEP 2019! Showcase your products and services to top decision-makers from around the world. Take advantage of this unique and exclusive opportunity to promote your message and expand your brand to over 5,000 attendees. 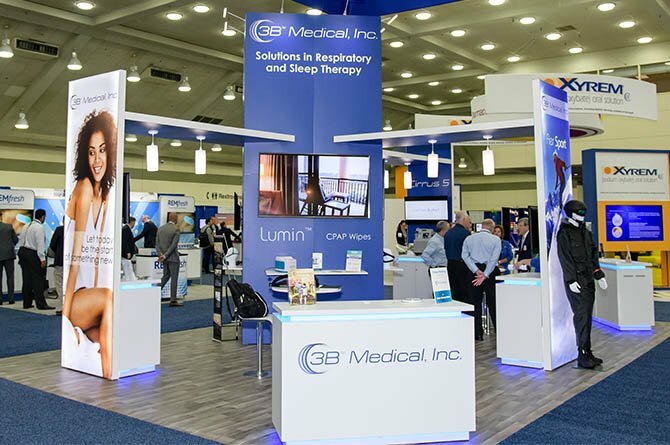 The SLEEP meeting provides exhibitors with the ideal setting to meet face-to-face with sleep medicine and sleep research professionals. Develop relationships with new prospects and strengthen ties with existing clients by exhibiting at SLEEP 2019. We work diligently to keep our costs down and pass the savings on to you. On average, exhibit space fees for SLEEP 2019 are 59% lower than other scientific meetings with sleep content. * Exhibit hours are subject to change. 7” x 44” one-line identification sign with company name and booth number. An island booth is bordered on aisles on all four sides, minimum 400 square feet. The number of non-profit booths accepted may be limited due to the size of the Exhibit Hall. Placement of this type of booth is at the sole discretion of the APSS. Non-profit organizations may only display material of an educational nature and are subject to all other rules and regulations. The APSS prohibits the recruitment of membership within the Exhibit Hall. All exhibitor applications are processed online through the SLEEP 2019 Exhibitor Portal. Each exhibitor will have the opportunity to identify their top four exhibit space choices. For special requests to reconfigure booth spaces, contact the national office (i.e. combining two adjacent 10’x10’ spaces to create a 10’x20’ space, or a 20’x20’ island to a 30’x30’ island). Organizations that previously exhibited at SLEEP 2017 and/or SLEEP 2018 will receive an email reminder containing your login information. The email will be sent to the primary contact on file. If the primary contact has changed or you need password assistance, please contact the APSS Meetings Department via email at info@sleepmeeting.org or by calling 630-737-9700. Once you are logged in, select “Buy a Booth” on the top left-hand corner of the screen. From the dropdown menu, select “Buy a Booth”. Complete the application by following the prompts on your screen. An automated email will be sent upon the successful submission of an Exhibitor Application. Notification of application acceptance will be emailed by March 7, 2019. An exhibitor application will not be considered complete until payment is received in full. Payment can be made through the SLEEP 2019 Exhibitor Portal via credit card or via check. Checks need to be made payable to Associated Professional Sleep Societies. Checks will not be accepted unless they are made in U.S. funds drawn on a U.S. bank. Upon entering the exhibitor portal, click “Buy a Booth” on the left-hand side of the page. Then click on the designated link on the bottom right-hand side of the page under the “New Exhibitor?” heading, to create your company account. Enter all mandatory information and click “submit” to create your company record. The following screen will provide you with your company password – please save this password for future account access. Complete the application by following the prompts on your screen. An automated email will be sent upon the successful submission of an Exhibitor Application. For questions or concerns regarding the exhibitor application process, please contact info@sleepmeeting.org or call 630-737-9700. Notification of application acceptance will be emailed by March 7, 2019. An exhibitor application will not be considered complete until payment is received in full. Payment can be made through the SLEEP 2019 Exhibitor Portal via credit card or via check. Checks need to be made payable to Associated Professional Sleep Societies. Checks will not be accepted unless they are made in U.S. funds drawn on a U.S. bank. Credit card payments will not be charged immediately – payments will be held pending exhibitor approval. Any refunds on booth assignment will be processed and returned following the final acceptance of the exhibit application and booth space notification letter. Each exhibiting company receives (4) complimentary Exhibit Hall pass registrations per 10’ x 10’ booth rental, with a maximum of 20 complimentary Exhibit Hall pass registrations. These registrations allow entrance to the Exhibit Hall only. Additional Exhibit Hall pass registrations may be purchased, $50 each by May 24, 2019 or $75 on-site, plus a $25 administrative fee. The APSS requires exhibitors to register prior to the meeting. If a company representative chooses to register on-site or is not pre-registered, the individual must provide proof of affiliation, such as a business card, and provide payment. Please note that there is a $25 administrative fee per on-site registration and you might expect delays at the exhibitor registration counter. On-site changes to pre-registered company representatives are to be made by the primary company contact designated on the application. For this reason, it is important to notify the APSS should the primary contact change between applying for exhibit space and the start of SLEEP 2019. No swapping or substituting of badges is approved until permitted by the primary company contact. Please note there is a $25 administrative fee per on-site change. Exhibitor badges will be distributed at the exhibitor registration counter during SLEEP 2019. Company representatives and meeting attendees must wear a badge in order to enter the Exhibit Hall. Badges must be worn at all times. Altering an exhibitor badge with the insertion of a business card is not permitted. Guest badges will not be issued for exhibitors’ guests. Booth personnel are permitted access to the Exhibit Hall two hours before and one hour after the official exhibit hours. An exhibit badge is required for entrance. Admittance during move-in or move-out times is limited to those individuals employed by the exhibiting company or directly responsible for installation/dismantling. Drape colors are red and white. The aisle carpet color is midnight blue. Each exhibiting company is entitled to one 400-character description of company products and/or services for print in the SLEEP 2019 Final Program. Character limitations for the descriptions will be strictly enforced. Descriptions longer than the allowable limit will be edited by the APSS without approval from the exhibiting company. The company name, city, state/province, country, toll-free number and website will automatically be printed in the program and are not included in the 400-character count. The description should be submitted electronically during the booth application process and must be updated with final edits no later than Monday, March 27, 2019. Company descriptions received after this date will not be included in the Final Program. The 400-character description for the SLEEP 2019 Final Program will also be listed on the SLEEP 2019 Online Exhibitor Listing. The Online Exhibitor Listing is an electronic directory of SLEEP 2019 exhibitors. This will go live April 10 and will stay open until October 6. Company descriptions must be updated in your booth console after your application to exhibit has been approved. Exhibit move-in will begin on Saturday, June 8 from 8:00 AM until 5:00 PM, and continue on Sunday, June 9 from 8:00 AM until 5:00 PM. All crates and carts must be removed from the Exhibit Hall by 5:00 PM on Sunday. Company representatives may continue working in their booth until 9:00 PM on Sunday with prior approval. Exhibit space not occupied by 5:00 PM on Sunday, June 9 will be forfeited, and crates will be removed at the exhibitor’s expense. Space may be resold or reassigned without refund. Exhibit move-out may not begin before 1:30 PM on Wednesday, June 12 and must be completed by 12:00 PM on Thursday, June 13. Packing/dismantling of exhibits in strictly prohibited prior to the official closing time. Exhibit space not cleared by 12:00 PM on Thursday, June 13 will be dismantled at the exhibitor’s expense and liability. Exhibitors who do not comply with these times may jeopardize participation at future SLEEP meetings. Note: Move-in/move-out times are subject to change. Lead retrieval systems will be available for exhibiting companies. Each badge will have a 1-D barcode that will enable the exhibiting companies to easily gather contact information, including the Physician National Provider Identifier (NPI) number, from the attendees. Detailed information on how to order lead retrieval will be provided in the exhibitor service kit. To submit your truss lighting request, visit our SLEEP 2019 sponsorship portal. Exhibitors who wish to hand out food and/or beverages from their exhibit space may submit their request by adding it to the exhibitor application form. This will require the approval of APSS management. Upon approval, exhibitors will be notified and provided with the catering contact information. Companies wishing to distribute food and/or beverage must pay a $500 non-refundable administrative fee. To submit your food & beverage handout request, visit our SLEEP 2019 sponsorship portal.